Discreet yet effective — we offer the most comprehensive, technically advanced roller blind and dim-out systems. Their clean lines and modern design complement any style, whilst providing maximum shading and minimum window obtrusion. 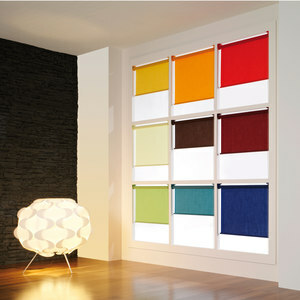 Silent Gliss offers the most comprehensive and exciting roller blind range on the market. Whether spring, chain, battery or electrically operated, you can shade your room from translucent to blackout by choosing from our wide fabric selection. Simple sophistication, timeless quality — our chain-operated roller blind systems are designed with a smooth operation so, even at maximum dimensions they work effortlessly. Our motorised dim-out blind system is delivered assembled, made to measure and powder coated in black or white. Fabrics are ‘zipped’ into the side channels and it comes with easy click-in side profiles and a choice of inside or outside recess fitting. Operations is via radio remote control or with the Silent Gliss Move app. Our chain operated dim-out blind system is delivered assembled, made to measure and powder coated in black or white. Fabrics are ‘zipped’ into the side channels and it comes with easy click-in side profiles and a choice of inside or outside recess fitting. Operations is via radio remote control or with the Silent Gliss Move app.